World Immunization Week is celebrated in the last week of April every year. This year the aim is to promote the use of vaccines to protect people of all ages against disease. Immunization saves millions of lives and is widely recognized as one of the world’s most successful and cost-effective health interventions. 2-3 million lives are saved each year. The focus is to immunize every child around the world. The past 12 months have been challenging for many reasons, and the arena of global health was no exception. The six diseases (i.e., Ebola, Yellow fever, Malaria, Polio, Cholera, and Zika) created near panic situations and made us appreciate the importance of immunization as well as the people behind it. It’s hard to foretell which diseases, new or old, will dictate the agenda in 2017, but if we can learn from the outbreaks and issues that shaped the past 12 months, we’ll be in a better position to prevent and control them. Immunization is More Significant than Ever. Why? Tools to Counter Outbreak Risks: Whatever epidemic hits next, we should be ready with the vaccines as part of the solution against those diseases. As populations continue to grow, along with climate change and urbanization, it will be increasingly necessary to have high herd immunity for the diseases we know are waiting to strike. This means strong routine immunization and sufficient vaccine stockpiles in addition to preparing for the diseases we currently know less about. Protecting the World’s Most Vulnerable People: Each year, more than 2 million children die from just four illnesses: malaria, pneumonia, diarrhea caused by rotavirus, and Japanese encephalitis. As of 2015, more than 19 million children were still not fully protected by even the most basic routine immunization. These children often come from the poorest, most demoted families, and the outlying communities. Although global vaccination reporting figures are improving, but they still face huge inequalities that we cannot afford to ignore. 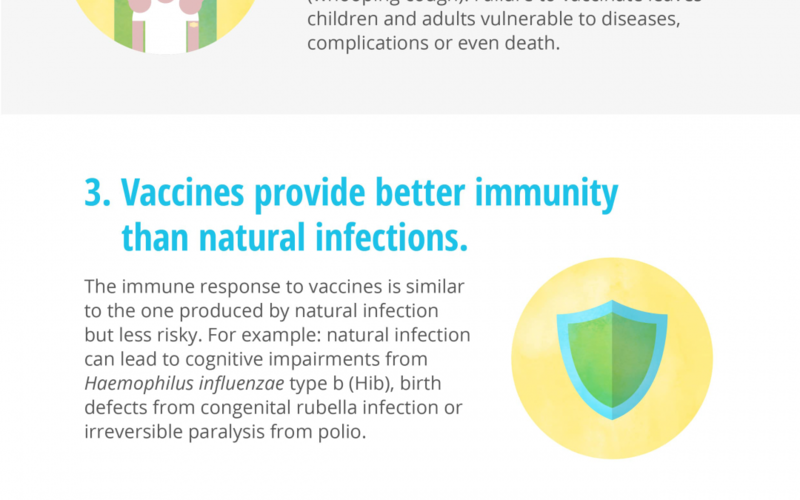 Immunization Protects Future Generations: Vaccines have reduced and, in some cases, eliminated many diseases that killed or severely disabled people just a few generations back. Smallpox is an example of a disease that has been fully eradicated worldwide. If we continue with the vaccination program, diseases like polio and measles will no longer infect, cripple or kill children in the future and might be eradicated like smallpox. We have More Vaccines against the Biggest Killers for Children: such as meningitis, pneumonia, diarrhea, hepatitis B, and many others. Yet, full exposure to the 11 vaccines that the World Health Organization (WHO) suggests for all children is only about 5%. We need to universally introduce these vaccines so that every child remains healthy and live up to their full potential. Health System Foundation: Immunization is one health intervention that stretches globally. As vaccines don’t introduce themselves, reaching the most demoted groups can open up pathways for other types of healthcare. And we are already seeing how previously unreached adolescent girls now have access to human papillomavirus (HPV) vaccinations to prevent cervical cancer, opening a window of opportunity to provide other vital health services. Vaccination – A Solution to Antimicrobial Resistance: We are heading for a post-antibiotic era in which common infections and minor injuries can once again kill a person. According to the UK government, there will be 10 million deaths by the year 2050 due to antibiotic resistance. While behavioral change and development of new antibiotics are absolutely essential, vaccines also have an important role to play in ensuring that infections don’t occur in the first place. If used widely, vaccines can save 800,000 children per year. The Moonshots against Cancer:: Earlier this year, US Vice President Joe Biden’s call for a “cancer moonshot” was greeted with excitement and was highly appreciated. Although, we already possess tools to fight certain cancers such as HPV and hepatitis B, we need to make sure that all the children have access to “moonshot vaccines” as the burden of cancer increases, specifically in developing countries where access to diagnosis and treatment is inadequate.